We don't usually show our math work like we did when figuring Cubs' arbitration numbers in our last post. When looking at predictions, we traditionally do no math at all. Of course, I'll look up stats to see what's there, but the computers do the math. This time, we're going to try something a little different. Since before spring training, we've maintained expectations that the Yankees will win their 2nd consecutive championship. The Red Sox, Tigers, and White Sox were not as competitive as we thought. For the last few weeks, as Texas and Minnesota built comfortable division leads, I have been struggling with who's better and who's best among the Rays, Rangers, and Twins. They each have great Aces, bullpens, etc. As usual, this led me to baseball-reference and Fangraphs. The InterWeb didn't really offer what I sought. I needed more than raw stats. I needed a formula but don't really remember team value formulas for the postseason in any Bill James, Tom Tango, MGL, readings. Google didn't help, and I wasn't about to Bing it. Before me stood an opportunity to try and value teams in a new way. I decided to launch Excel to build a formula. To build the formula, I considered not just what these teams have accomplished, but how statistics and my own opinions and built-in biases may predict postseason performance. What matters in the playoffs and World Series? Because of the off days littering the postseason schedule, strategy is different. Teams don't use five starters in the postseason. Some clubs don't use a fourth starter, and the ones that do barely even need them. Fourth starters may get anywhere between zero and three postseason starts, no more. Other differences with postseason play is the length of games. Sure, they are still 9-innings, but they've certainly been "shortened" by bullpens in the past 20 years. 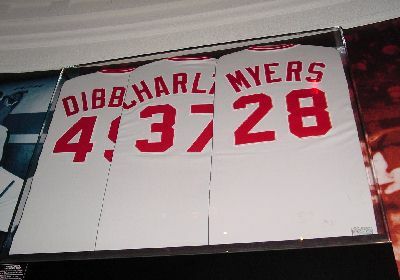 In 1990, Lou Piniella's Cincinnati Reds started virtually giving teams only 6 innings per game to score because the 7th, 8th, and 9th were taken care of by the Nasty Boys of Norm Charleton, Rob Dibble, and Randy Myers. Bullpens didn't change across the league overnight, of course. Nasty boys don't grow on trees. Rather, we have seen a gradual shift where bullpen construction has become more and more critical to playoff teams. Managers want to shorten the game and have a few guys they can count on to get the last nine outs. The Yankee Way was resurrected in '96 behind, among others, Rivera and Wetteland. The Yankees won five titles by and large because of Mariano. Of course, some teams won mostly because of starting pitching. Both Marlins teams won because of their aces, primarily. The White Sox in '05 hardly even used their bullpen on their way to a title. CC Sabathia was a horse last season for the Yankees. Bullpens like the '90s Reds are extremely rare, but they are certainly a competitive advantage when they do manifest. The most similar example are the 2002 Angels, who won the World Series in large part because Troy Percival, Brendan Donnelly, and Scott Schoeneweis were for basically unhittable, and a 20-year old Venezuelan kid named Francisco Rodriguez dominated enough to become K-Rod. Even the mere addition of one extraordinary arm to a contenders bullpen has proven to yield fantastic results as we saw with Dontrelle Willis in '03, Bobby Jenks in '05, Adam Wainright in '06, and David Price in 2008. We'll see what Aroldis Chapman may do for the Reds this October. Very exciting! While teams may try to shorten the game, they can lengthen their benches by having fewer relievers. Number four and five starters can either be placed in the bullpen or left off the postseason roster. If the starter(s) go(es) to the bullpen, then some other reliever(s) will be left off the roster. The goal being that you want as many position players as possible for pinch hitters and defensive flexibility. A team may only need nine or ten pitchers instead of the usual ten, eleven, or twelve they carry during the regular season. Keep in mind, because of increased off days in the postseason, relievers are available for every game. A manager cannot lean on relievers every day during the regular season, but in the postseason, things change. Here's my attempt at an insightful snapshot into the construction of the formula... Comparatively rate the four teams by each position, starting pitchers, ace starter, bullpen, closer, lhb pinch hitter, rhb pinch hitter, and utility player. I started rating them with 1, 2, 3, and 4 - straight up ranking. Then, I decided to take the 10 points (1+2+3+4 = 10) among the four teams and spread them out with more precise rankings. For example, in a given category, the number given to the four teams could be 1.6, 2.4, 2.9, and 3.1. That adds to 10, also, but we took a little here and there to fill in the gray areas. How much each position matters is also a factor in the formula. Having a strong ace to your pitching staff is much, much, much more important than a good right handed pinch hitter off the bench, naturally. In Part II of this post, we will show more of the framework for the formula, as well as the plethora of statistics we included to dilute our biased scouting eye. The statistics and weights we apply are a real hoot and get to the point of this exercise. We, as fans, have the freedom to choose any criteria we want for evaluating players and teams in the game. Create your own formula. Take what we share here, leave out what you don't like, and add anything else that's near and dear to your sensibilities. Come back soon for Part II.